Welcome new GymbaROO franchise owner. We have created this basic site manual to show you how to navigate around your site’s admin section, and how to perform its general functions. Let’s look at each section in more detail, and also recommend the best order in which to complete your GymbaROO site setup. The first step to setting up the your GymbaROO admin is to go to the “Franchises” tab and enter in the details for your franchise. On the Franchise page you will see 5 submenus. This is how many make-up slots a student receives per term. If you are accepting credit card payments from the front-end of the site, this allows you to charge a surcharge fee on all credit card transactions. This is a percentage of the total fee for the enrolment. The royalty percentage specified by GymbaROO head office used to calculate the royalties on the royalty report. This is also the advertising levy specified by GymbaROO head office, and is also used to calculate the royalty report. If you are accepting PayPal payments from the front-end of the site, this allows you to charge a surcharge fee on those transactions. You can set it as a fixed charge or a percentage of the fee paid. For the franchises that charge for music, they need to enable this function, and it will then include the music fee in the royalty report calculations. This is the value charged for the music fee. Ticking this box allows you to show trial students in the class lists. If ticked, trial students will be included in the total enrolment number in the top of the calendar page. At the end of the enrolment process on the front-end of the website, the users are given the option of filling in a survey which is specified by the GymbaROO head office. This list is provided by the GymbaROO head office, and is pre-populated, but you can edit the content in this section. This is a list of all the registered students, along with their GymbaROO membership numbers. This page allows you to manage administrative users to your site. it is advised to have multiple administrative accounts as it allows us to track which users made changes to the site, as it allows us to track changes made to the site. The next step is to set up the terms and classes to display on the front-end of the website, so that users can enrol their child(ren). Set the term name – is it one of the regular terms (numbered 1 to 4), or a Holiday Program that is happening between regular terms? Set the type of term – either a regular Term or a Holiday Program. This is for your own information – any notes you wish to record that is important for this term. This will not appear on the front-end. By enabling this, it allows parents to enrol their child(ren) in trial classes from the front-end of the website. By ticking the box, this term will be seen on the Timetable page on the website frontend, so that parent can enrol their child(ren). If you don’t have all details finalised for the term yet, you can leave this unchecked and submit the term to save the details you’ve entered thus far. By ticking this box, this becomes the default term that appears on the Timetable page on the site front-end. Populate term with data from a previous term? To save time on setting up a new term from scratch, you can use this function to import the classes, class fees and time slots from a previous term. Tick the box, then select the term you wish to import data from via the dropdown list. When using the “Populate term with data from a previous term” function, you can tick this box to enrol the same set of students from the selected term. This saves all the information you have recorded. Which term you are creating? What is the cost of enrolling a single child? The following fields are “legacy fields” and will be removed from the next GymbaROO version. How Many students must be enrolled before classes are marked as filling up on the calendar? Setting up class families allows you to group classes together according to the ages of students, and abilities. This helps parents when selecting make-up classes by only giving them the option for classes which match their child’s development level. Essentially you have 2 different class types, but their development level is so close that students from one class, can attend a makeup class in the other. Example – A class for kids aged from 1.5 to 2.5 years, can attend a make-up class with kids aged 2 to 3 years. To have this new linked class appear on the timetable on the site front-end, a new combined class will have to be created. When selecting a name for the new combined class, use a combination of the two single class names. For example, if one class is called “Koalas” and the other “Penguins”, we would name it “Koalas / Penguins”. Refer to the “Create a class” section of this manual. 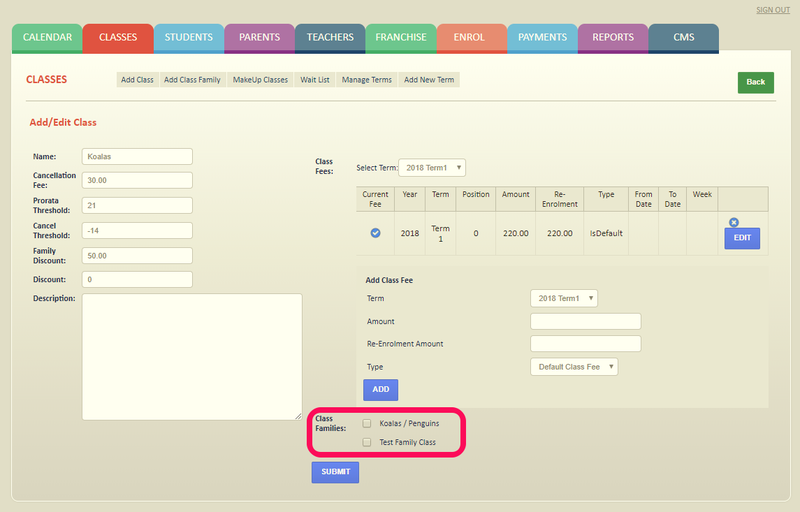 If you wish to edit the Class Family name at a later stage, edit the existing name in the Family Name field, and click EDIT to save. Repeat the above steps for the other classes you wish to group together with this class. A parent enrolling a child(ren) through the front-end website. The differences between the two, is that when a parent enrols a child through the site, they pay immediately (either via PayPal, credit card or EFT), and that the child(ren) are not immediately enrolled into the centre, but will sit in an enrolment pending list – waiting for the admin to approve the enrolment. Whereas when an admin enrols a pupil through manual enrolment, the pupil is enrolled directly into the centre and payment will be immediately collected from the parents at a later stage. Re-enrolment is for a student that has previously enrolled in a term (the difference between enrolment and re-enrolment is that for reenrolment you can select a pre-existing parent / caregiver. By doing this the form will prepopulate with the existing parent / caregiver’s detailsso you don’t need to fill it in again, and also links the student to the correct family across terms. AutoEnrolment is a system function that the site uses, and should not be used by administrators. When you create a new caregiver, an email is sent out to the caregiver with their login details to your GymbaROO site. Fill in the address and student details as supplied by the parent, as well as which class they have enrolled in. If your invoice amount is greater than 0, then an invoice will be generated for the students, and will be emailed to the caregiver. Tick the “Accept Terms & Conditions” box, and click “SAVE”. You can then manage the waitlist from the admin, and if a slot becomes available for that class, you can then select a student from the waitlist to fill the available slot. See the Waitlist section for further details on how to manage it. 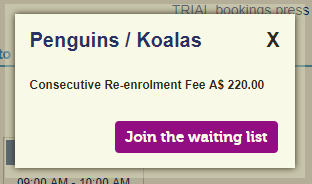 A popup will appear which will allow users to start the enrolment process. 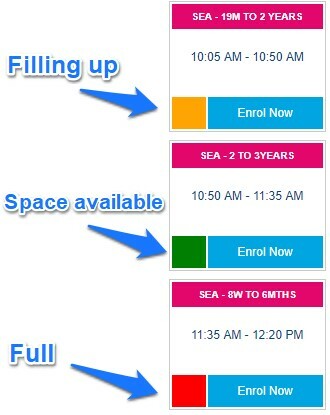 If you are allowing trial enrolments from the front end and have set up trial enrolments in the admin, by specifying the number of trial enrolment slots in the timeslot, and enabling the Show Trial Enrolment on frontend timetable option on the Add New Term or Manage Term page, then an option to enrol trial students will be available on the pop up as well. If you click the enrol button, you will be taken to a page where you can either login, or if you don’t have an existing account, create a new account. 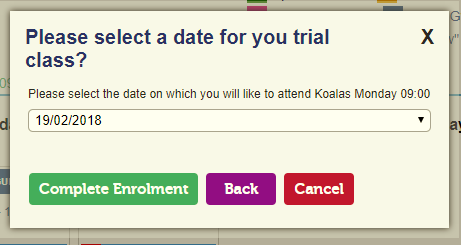 If you click Trial Class, you will get a second pop up which will allow the user to select a day on which they want to attend a trial class. Once a person has clicked on Complete Enrolment on the trial class pop up, they will be taken to the same page which will ask them to either login with their existing account, or create a new account. For registering a new account, they need to provide their email address, password, first name, last name. telephone number and mobile number. Once they have registered, an email will be sent to them with their login details, and confirming their registration. 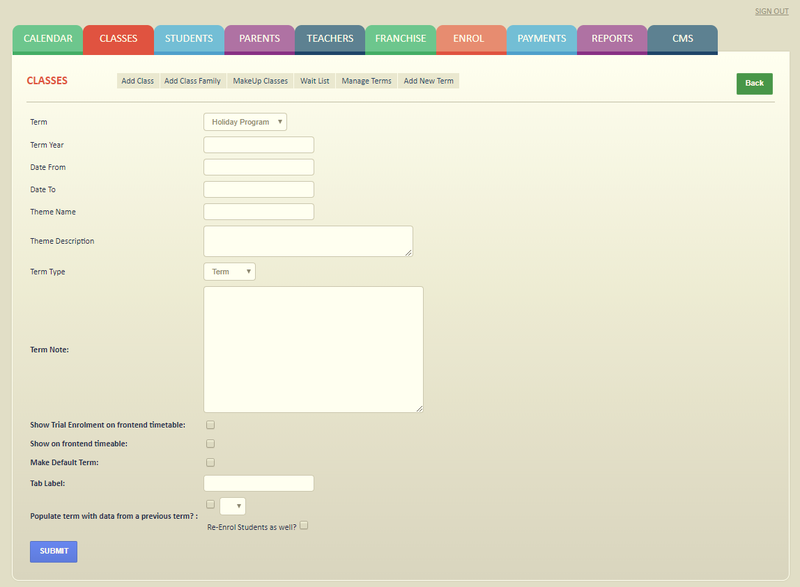 Once the user has registered (or logged in), they’re taken to a page where they must fill in the student’s details. If a student has been enrolled in a previous term, they are given the option to select a student from an existing dropdown list. Else for a new student they must fill in the mandatory student details form. If you are enrolling another student at the same time, you can click the word ADD in the Would you like to ADD a second student to this order? Line. 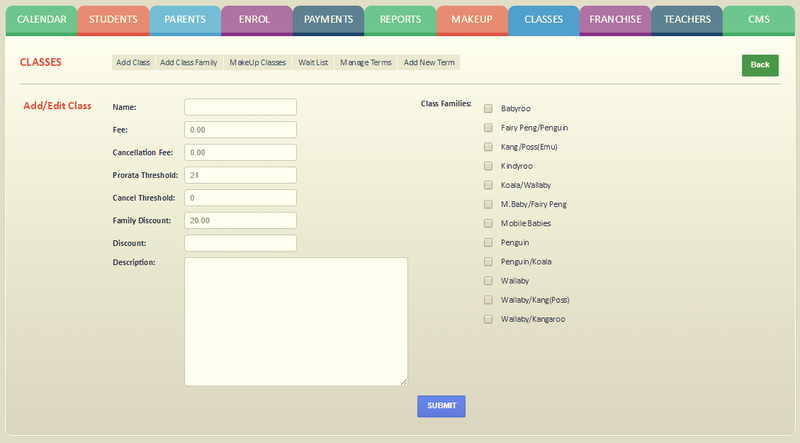 This will take you back to the timetable where you can select another class to enrol the additional student. You won’t be required to log in or register a second time, you will be taken straight back the Add Student Details page. Next you will be taken to a payment page, where the user can select which payment method they would like to use. Options are PayPal, EFT or Credit Card. If a person uses a credit card option, you will be emailed an encrypted version of their credit card details, which you can then decrypt in order to take a credit card payment through a POS system. For PayPal, they can either pay with their PayPal account, or a credit card, and the payment will be taken off directly, and you will see a reference number in the enrolments list, where you can confirm that the payment has been made in your PayPal account. For a trial enrolment, no payment is requested. 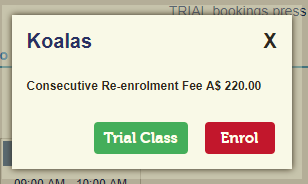 The user can simply check out, and the trial enrolment will appear in the Trial Enrolments section in the admin. 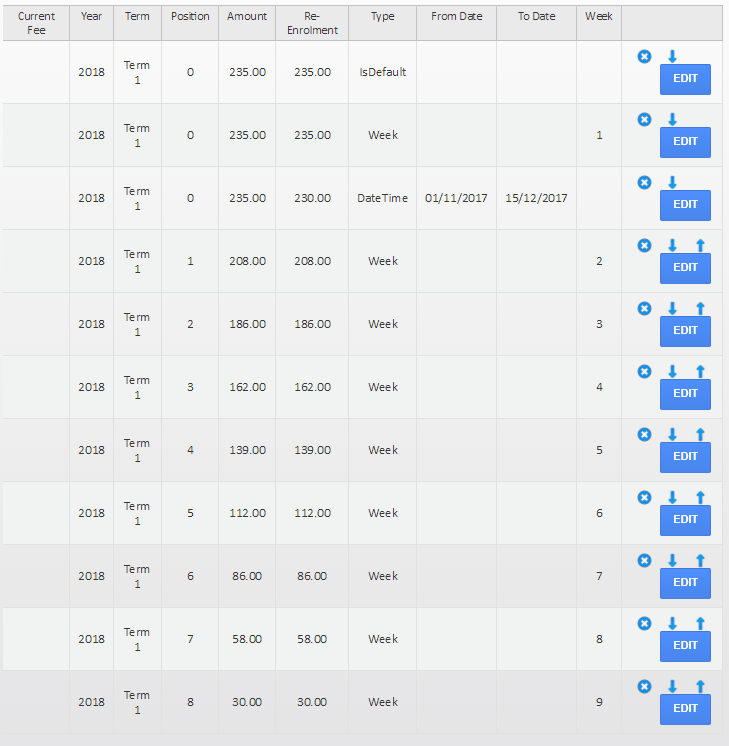 Once a user clicks on Checkout, they will get an order complete page. On this page is a survey, which they can then complete themselves (if they wish to). This survey is set up in the Franchise section in the admin’s “Advertising Sources” page. After completion, a second email will then be sent confirming the enrolment and an invoice email will also be sent. To complete the enrolment, the admin needs to go to the ENROL tab, where all pending enrolments will be listed. The admin is given the option of either enrolling the student, or cancelling the enrolment. It is important to note that while a student is waiting in the pending list, a spot is held for them in the class, and therefore reduces the number of available slots for additional enrolments. 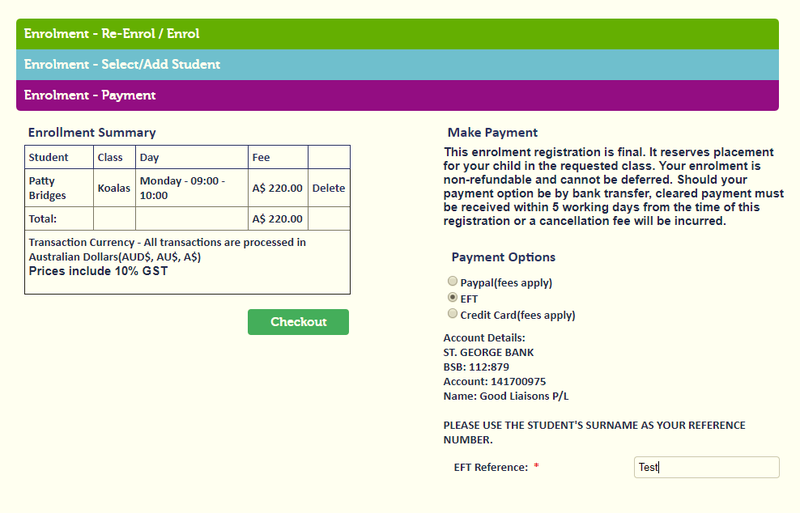 For a credit card enrolment, if you click the enrol button, you will get a pop up menu requesting the decrypt string. This would have been emailed to you once the user completed the enrolment. You need to copy the decrypt string into the available text box, and click decrypt. You will then be presented with the credit card details, which can be entered into your POS system. We will be adding more information to this manual as we complete it.